Investors will have a lot to consider Tuesday, with a full slate of corporate results and economic reports on tap and the aftermath of the devastating Boston Marathon bombings. U.S. stock futures were up nearly 1% following a strong housing report. Goldman Sachs (GS), Johnson & Johnson (JNJ) and Coca-Cola (KO) released results before the open, while Intel (INTC) and Yahoo (YHOO) are on tap after the market closes. Goldman Sachs reported earnings and revenue that topped forecasts, pushing the bank's stock higher in premarket trading. Dow components Johnson & Johnson and Coca-Cola both also reported better-than-expected profits. Target (TGT) lowered its earnings and sales forecast, blaming seasonal factors. 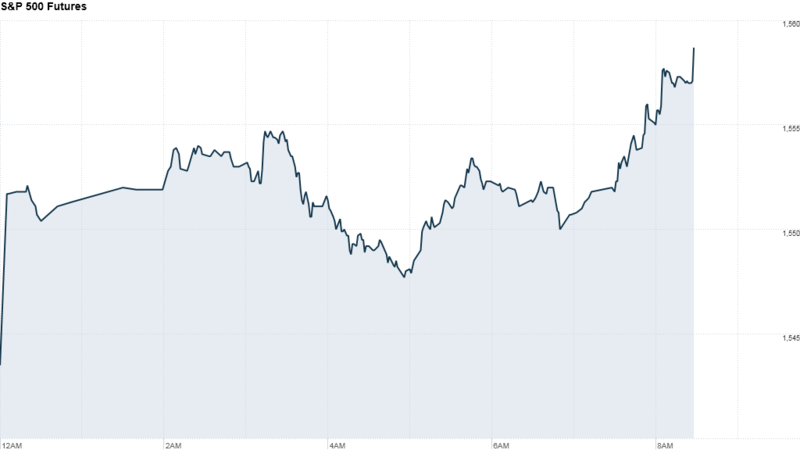 Stocks fell Monday, with the sell-off intensifying following news of two explosions in Boston. The Dow plunged 266 points, or 1.8%, while the Nasdaq and S&P both lost more than 2%. CNN reported that the bombs exploded near the end of the race, killing three people and injuring at least 144. The FBI has taken the lead in investigating the attacks. Meanwhile, gold rebounded a little Tuesday, a day after a 9% tumble to a 2-year low. Other commodities were mixed. The Boston bombings have "a minimal economic impact, but a very large emotional impact in the marketplace," added Lazard managing director Art Hogan, who was working in Boston at the time of the attack. "This is a harsh reminder that we live in a very dangerous world." Hogan said the impact of the attack on Tuesday trading remains to be seen, and is likely to be influenced by the release of new information. On the economic front, investors are digesting morning reports on inflation, housing starts, building permits and industrial production. The International Monetary Fund is also due to release new global economic forecasts Tuesday. The CPI slipped 0.2% in March, more than the 0.1% decline that economists expected. Core CPI, excluding food and energy prices, rose 0.1%. Housing starts for March topped 1 million for the first time since June of 2008, reaching an annual rate of 1,040,000. Building permits came in at an annual rate of 902,000 in March, slightly less than the forecast of 945,000. European markets were flat in midday trading on concerns about slowing global growth, while Asian markets ended mixed. The Nikkei dropped 0.4%, the Shanghai Composite added 0.6% and the Hang Seng fell 0.5%.